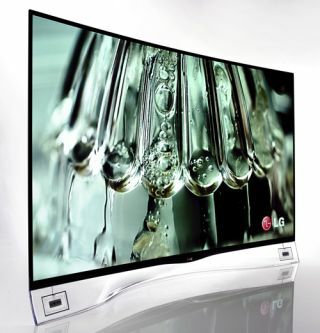 LG slashes the price of its 55in curved OLED TV by £3000 | What Hi-Fi? Could this be the start of an OLED price war as manufacturers prepare to launch more new OLED TVs at CES in January? LG appears to have slashed the price of its curved 55in OLED TV – which we're currently giving away as a competition prize – by a whopping £3000. This brings the LG 55EA980W, which has been on sale since September at £8000, down to a (slightly) more affordable £4999. Richer Sounds is already advertising it online at the new price, as are other retailers such as John Lewis and Crampton & Moore. We have already reviewed the LG 55EA980W at its launch price, and gave it four stars. We were impressed by its stunning black levels, punchy highlights and a natural touch with colours, but worried about its lack of 4K compatibility. Arch-rival Samsung, meanwhile, still seems to be selling its 55in curved OLED model, the KE555S9C, at its original price of £7000. It will be interesting to see if it follows LG's lead and cuts the price too. We have a strong hunch it might. Earlier today both Korean companies claimed they would be launching the "world's first" 105in curved Ultra HD 4K LCD/LED TVs at CES 2014 in January.